In 1964 I started a new job at the Macmillan Company, my first as a full-fledged editor, with my first little office, really just a cubbyhole, a stall with shoulder high partitions. Under the desk, however, I found a big old dusty grocery box with about 1600 scruffy, smudged, and dog-eared pages. It had been there for months, and turned out to be a forgotten manuscript under contract that no one had bothered with. Since I didn’t have any other projects of my own yet, I started reading and couldn’t put it down. This first draft was on the one hand a huge mess, but at the same time a stunning, powerful narrative with an authentic street-kid voice telling his story about growing up in Harlem, getting into trouble, becoming a gang member and street thug, getting shot, then cleaning up and turning his life around. True, too. Not a novel. I took the rough manuscript home and worked on it a little bit at a time on nights and weekends for four months – cutting, changing the structure, polishing the dialogue, cutting, cutting more than half the book. I struggled to preserve the authentic narrative voice, the raw honesty of the dialogue, the rhythm and pacing of the plot, scene by scene – while at the same time shaping, focusing, cleaning and polishing it up, giving it the title Manchild in the Promised Land. Finally, with some trepidation, I called Claude, then working as a postman in Washington DC, introduced myself, and sent him what I had done so far. Luckily, he liked it, we hit it off, and became good friends. He came up to New York regularly and we continued another three months of pruning, polishing, and shaping before agreeing it was ready. When I began to send it around in galleys, the response was phenomenal. The right book at the right time, smack in the middle of the civil rights movement, and the beginning of black power. Norman Mailer gave us a quote saying it was the best thing he’d ever read about what it was really like to grow up black in Harlem. In a landmark deal at the time, the paperback rights were sold pre-publication, for a record high $100K. 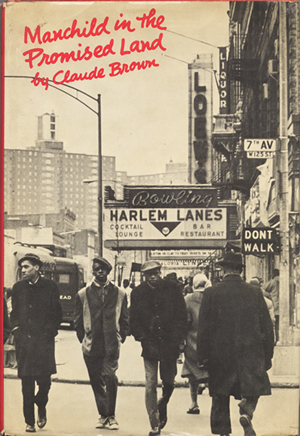 Tom Wolfe, then a young journalist for the Herald Tribune New York Magazine Sunday supplement, wrote a long piece about going up to Harlem with Claude to see the old neighborhood. The book made the New York Times bestseller list and has sold hundreds of thousands of copies since throughout the world, every year, for what is now more than 40 years, and remains required reading in high schools and college classes. A heady experience for young Claude Brown and his editor. Claude never wrote another book, but spent a lifetime as an inspirational speaker and role model for young black men. I learned a lot about whipping a book into shape and making a bestseller.